I recently received some goodies from Magic Bodyfashion, I am wearing one of them on these photos: the magic clips. These come in really handy, because these clips put your bra straps together, so that you can wear a tank top and don't see your straps. The other product I received was the laundry bag, and I am going to tell you why this is super handy. I am living by myself for over 5 years now, so I do my own laundry for such a long time. In the past I have lost the brace from a bra in the washing machine, and I couldn't find it anymore. Luckily the washing machine wasn't broken, but I didn't had a brace to put back in my bra. A laundry bag comes in very handy because when your brace gets out of your bra it stays in the bag, and it also makes sure your bra's stay in better shape. 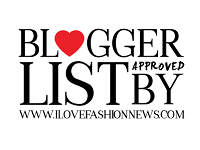 I am nominated for the Zalando's Blogger Awards, I would really appreciate it if you would like to vote for me by clicking on the button. Die Magic Clips zijn inderdaad heel handig! En ik moet eigenlijk ook hoognodig een waszak kopen. Ik was mijn BHs nu altijd op de hand, haha!